Using stencils is a great way to carve pumpkins, and there are many different bird-themed pumpkin carving stencils available for anyone to enjoy, from novice carvers to experienced artists. Carving a bird-themed pumpkin can be a fun way to show your love of birds and enjoy Halloween decorations, and these stencils can help you create a perfect piece of autumn avian art. Tape the printed stencil to the pumpkin, cutting slits in the paper to help it conform to the round shape of the fruit, then follow the stencil's outline for carving. Use an awl, nail, pin, thumbtack or similar tool to poke holes through the stencil to transfer its design to the pumpkin, then connect those dots when carving the pumpkin. Trace the stencil's design onto the pumpkin with a grease pencil, marker or another writing instrument, then follow those lines while carving. Most importantly, have fun with the stencil and feel free to improvise to make the most of your pumpkin's unique shape and size. Resizing a stencil before printing can help be sure it is appropriately sized for your pumpkin, or print out the stencil you want to use and take it with you when choosing the best pumpkin. Please note: Some sites may require a sign-up or registration to download stencils. In addition to these free stencil patterns, you can also make your own pumpkin stencil. Simply print out a coloring page or outline drawing of a bird, or even draw one of your own to transfer to a pumpkin. While there are plenty of free stencils available, advanced carvers may prefer to purchase more elaborate, unique stencils. Previews of these stencils are available, but each requires a small fee to download the detailed template. Instructions and tips are often included with purchased stencils as well or are available elsewhere on each distributor's website. Choose an appropriate pumpkin for the design, taking into account size, shape and proportions that will suit your carving ambitions. Avoid pumpkins that show signs of softening, rotting or bruising, as they will spoil much more quickly than a fresh, firm fruit. Wash the pumpkin first, using a non-scratch sponge if necessary to remove stubborn dirt. Allow the fruit to dry thoroughly before carving to make carving safer and easier. Always supervise children when carving a pumpkin, and do not allow children to handle sharp knives without appropriate guidance. After removing the top or a cutting an access hole in the back of the pumpkin, scoop out the seeds carefully, leaving a one-inch rind for carving. Pumpkin seeds can be added to bird feeders! Take your time carving, and always use the appropriate tools to make the job easier. If carving a detailed stencil, carve small areas before big ones. To keep the carved pumpkin from softening and rotting too quickly, soak it briefly in a weak bleach solution and coat cut edges with petroleum jelly to preserve moisture. Keep the pumpkin in a shaded, cool place, moving it indoors if necessary to protect it from vandals or hungry wildlife overnight. After Halloween, compost the pumpkin or turn it into a carved pumpkin bird feeder so even the birds can enjoy your bird-themed art. 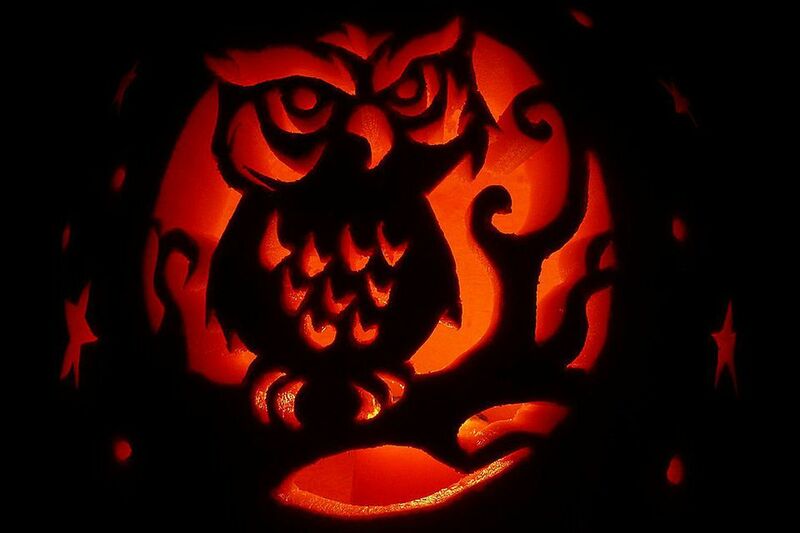 Want to add pumpkins to your outdoor autumn decorations but have no hand for artistic carving? Try these alternative pumpkin decorating methods, combined with bird-themed stencils and pumpkin patterns for unique autumn artwork. Or try making one of these three easy pumpkin bird feeders instead, and your fall migrating birds will thank you!